The Walter P. Webb Historical Society has lead the annual 'March to the Grave' for the past seven years. The march begins at Austin Hall and ends at Oakwood Cemetery. Sam Houston State’s celebration of Gen. Sam Houston’s birthday and Texas Independence Day on Monday (March 2) will include a march, a graveside ceremony, and a luncheon, as well as a marker dedication and exhibit grand opening for Houston’s wife Margaret Moffette Lea Houston. The activities will begin at 10:30 a.m. on the north side of Austin Hall, where participants will meet for the traditional "March to the Grave." From there, the group will walk down University Avenue to Oakwood Cemetery, where a ceremony will be held at Houston’s grave site. SHSU President Jim Gaertner, Student Government Association president Christopher Yancy, the Walter P. Webb Historical Society, and more than 100 history students are expected to participate. The "March to the Grave" tradition began in 1889 on the 10th anniversary of the university, then called Sam Houston State Teachers College, where the faculty and students commemorate Sam’s birthday and Texas Independence Day by marching seven blocks down the hill to the grave, where the Texas Historical Commission placed a wreath and presented a program. 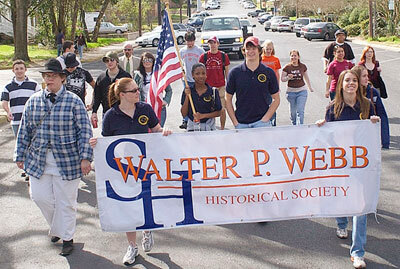 The march ended in 1932 due to the Depression but was resurrected in 2001 by the Walter P. Webb History Society, which continues the tradition today. At 11 a.m., the community will remember the general during a graveside ceremony at Oakwood Cemetery. It will include a speech on the importance of Sam Houston by Regents’ Professor of history Archie MacDonald, from Stephen F. Austin State University. The SHSU SGA will present a wreath at the grave, followed by brief speeches by Huntsville Mayor J Turner, county judge Danny Pierce, and county clerk James Patton, as well as a representative from the Alabama-Coushatta Indian reservation. The ceremony will be followed by a luncheon at 12:30 p.m. at the Katy and E. Don Walker, Sr. Education Center. After the luncheon, the museum and the Texas State Society Daughters of the American Colonists will dedicate the Margaret Moffette Lea Houston marker outside the Woodland Home on the museum grounds at 2 p.m.
During the time that the Houston family lived in the Woodland Home, it was Margaret and the children who spent most of their time there, while Houston was in the Senate in Washington, D.C., according to Sam Houston Memorial Museum director Patrick Nolan. The TSSDAC offered their sponsorship in helping to create the marker itself. It includes a short biography about Margaret, how she met Sam, and information about her living in the Woodland Home. Following the ceremony, the grand opening of the Margaret Lea Moffette Houston Exhibit, which will become a permanent display at the museum, will take place in the Rotunda of the north gallery. The TSSDAC also provided the funding for the exhibit. The luncheon is by reservation only. All other events are free and open to the public. Austin Hall is located at 1741 University Avenue, the Walker Education Center is located at 1402 19th St., and the Oakwood Cemetery is located at Sam Houston Memorial Drive (Avenue I) and 9th Street. For more information, contact the Sam Houston Memorial Museum at 936.294.1832.